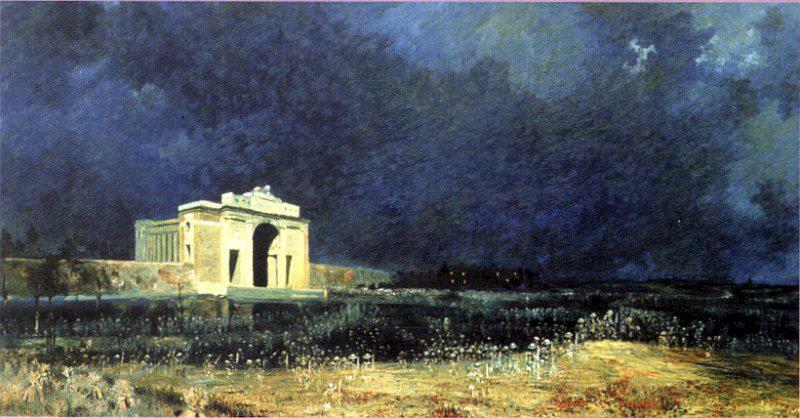 Monday is Remembrance Day, and this year happens to be the 95th anniversary of the end of World War 1, the war far too optimistically described as "The war to end all wars". A really good way to commemorate the day is to read what is possibly the best speech ever given by an Australian politician. We do not know his rank or his battalion. We do not know where he was born, nor precisely how and when he died. We do not know where in Australia he had made his home or when he left it for the battlefields of Europe. We do not know his age or his circumstances - whether he was from the city or the bush; what occupation he left to become a soldier; what religion, if he had a religion; if he was married or single. We do not know who loved him or whom he loved. If he had children we do not know who they are. His family is lost to us as he was lost to them. We will never know who this Australian was. Friends and supporters of the egregious cancer quack Stanislaw Burzynski love to tell us how the FDA love him and that is why they approved a Phase 3 clinical trial that he pretended he was going to run. Of course, on other occasions they told us that the FDA were out to close him down but couldn't because they had no evidence. That the FDA should both support and attack him might seem like a paradox, but lies and inconsistencies are just the way of going about daily business in the quackery world. Well, the FDA have spent some time this year looking at Burzynski's operation and have released a report. You can see it by clicking on the image at right, but here is a summary, with my comments in italics. Failure to prepare or maintain adequate case histories with respect to observations and data pertinent to the investigation. a. Your MRI tumor measurements initially recorded on worksheets at baseline and on-treatment MRI studies for all study subjects were destroyed and are not available for FDA inspectional review. The informed consent document did not include a statement of any additional costs to the subject that might result from participation in the research, as appropriate. Legally effective informed consent was not obtained from a subject or the subject's legally authorized representative, 811d the situation did not meet the criteria in 21 CFR 50.23 - 50.24 for exception. Investigational drug disposition records are not adequate with respect to quantity and use by subjects. I have a suggestion for Stan. 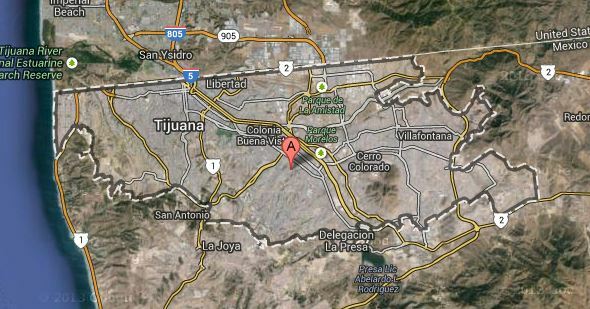 If he needs to move his operation to somewhere where he won't suffer so much interference, he could try this city. If he puts the name into Google Maps it will even tell him the best way to drive there, and he won't even have to pack the filing cabinets that he currently has for show. Mystery from Facebook. As usual I'll give credit if someone can tell me who owns it. When an anti-vaxxer appears in a forum they usually disingenuously start off by pretending that they are just seeking information. The two most common things they do to expose themselves are to ask why vaccinated children should be afraid of unvaccinated kids if vaccines work and to declare that nobody will ever take a whole series of childhood vaccines on the one day. He said that he would organise a doctor and the vaccines, plus media attention, but warned me of what I was in for by sending me to the schedule link that I had already provided. I pointed out that I already knew about the schedule. He demanded that I sign a waiver, taking all responsibility myself for anything bad that might happen. I said that I wouldn't be signing any such thing, and if he wanted to be a part of it he had to accept that. He said that it wouldn't matter because I would have to source all the vaccines myself and find someone to do the injections, because he had never said that he was going to do these and might not even be there on the day but if I recorded it he would be interested. I remarked that he seemed to be changing the rules of the game. He deleted his previous posts and denied ever saying what he had said. He ran away and hasn't been heard of since. So here's the plan - at 12:35 on November 23, five minutes after I finish my talk and before I rush off to get my sandwiches and wraps before all the best ones have been taken, I will lead a round of raucous ridicule of any and all anti-vaccination liars who offer this ridiculous "challenge" and then back away when someone accepts. I have accepted many times, and all I ever hear back is the sound of crickets. Dead crickets. I will say it again - I am prepared to take a complete schedule of childhood vaccines on the one day. All I need is some anti-vaccination liar to stop lying and organise it. But they won't. The reason they won't is, like their continual demand for crossover clinical trials of vaccines, they know that it is impossible so they can almost truthfully say that it has never been done. 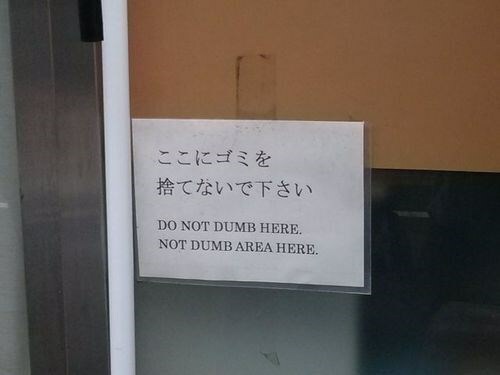 I have now changed my evacuation plans. Instead of being ready to flee from the bushfires I am getting the local timberyard to send round some gopher wood so that I can resume ark construction. We've had 11% of the 127-year average annual rainfall in the last seven days, so the fires are now officially out. And this is officially the dry season - the Rural Fire Service said two weeks ago that 100 millimetres of rain over a week was needed to completely extinguish the three big fires near my house, but this was unlikely because rain like that was not expected until some time in January. 166mm in the last week. For those who deny the possibility that the climate has changed, maybe they might like to explain why the weather has become increasingly erratic over the last few years. Here is a picture of my car, taken on October 12, 2012. 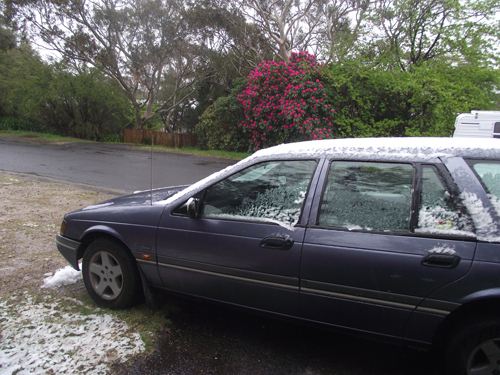 On the anniversary of that snowfall people were being evacuated from their homes because of the threat of bushfires and houses were being destroyed. This last week's rain has exceeded the mean rainfall for all except two months (February and March) and will be above the March average by the end of today. Here's what has been happening in the last two weeks. 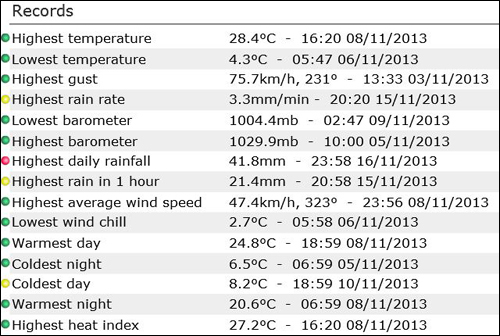 Average maximum temperature for November is 20.3°C, and the minimum is 9.9°C. Note that the maximum and minimum for these have already been a few degrees in the wrong direction and occurred two days apart. That is what I mean by erratic weather. I know that weather isn't climate. It's colder today than it was on Thursday, the argument always used by climate change deniers when disputing reality with "warmists". But climate affects weather, and the changes in weather patterns of the last few years and decades is undeniable. It is the trend that matters, not short term fluctuations. Oh, you can cherry-pick date ranges to prove anything you like (which is why the deniers love ten-year periods or even shorter), but facts are facts. 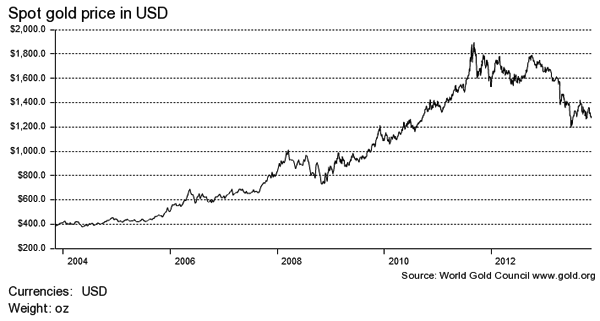 Here is a chart showing the price of gold over the last ten years. Using climate change denier methodology I can demonstrate that the price of gold has not been rising. All I have to do is use the trends during 2008 and since about mid-2012 to show that it is actually falling. The fact that the starting points for both ranges differ by about $800/oz can be avoided by only using one range and calling anyone who disagrees with you "growthists". Just look at the last twelve months (ignoring July to September, of course). It's obvious that anyone who bought gold ten years ago as part of their retirement plan portfolio was mad. You might have heard of a currency called Bitcoin. It only exists on the Internet and according to it's supporters it will eventually replace all other currencies used for electronic payments. It is so powerful that the banks don't know what to do about it. It is absolutely secure and can't be manipulated because the software that runs it is open source so anyone can look at the program code and see what it does. (The fact that someone claimed to have had $1.4 million worth of Bitcoins stolen from his electronic wallet this week is just a hiccup. Of course, with no audit trail of any kind he didn't want to bother the police with this because there's nothing they can do. Cynics are suggesting that as he ran the "exchange" where the money was stored there might be more to the story, but what "18-year-old" would ever bother about "losing" that trivial amount of money?) One argument presented to me was that "fiat currencies" (the red flag du jour when talking to believers in financial conspiracies) have no actual asset backing since countries went off the gold standard and therefore the US dollar, the Yen, the Euro, the UK pound and the Australian dollar (the biggest players in the foreign exchange market) could all be worth nothing tomorrow and nobody will accept them as payment for anything. Questions about the asset backing of Bitcoins were met with non sequiturs about software and algorithms and how nobody controls it. I have been somewhat critical of the proponents of this magical money for several reasons. One of them is that everything they say about the future of this is an echo of what I have been hearing for decades about multi-level marketing, which has always been a couple of years away from totally dominating retail sales of almost everything. (The silliest thing was someone telling me that the only way you could buy a Honda car in Japan was from an Amway distributor.) It doesn't take much work to find that the numbers related to MLM show that it is no threat to the retail industry and never will be. The main function of Bitcoin seems to be speculation in the value of Bitcoins. When I asked where I could spend them to buy things that I might really need to buy, such as food and petrol, I was referred to a list of a hundred or so places that would take the currency. Most of them had "bit" in their name and only offered unspecified "services". The only place that seemed to be taking a lot of them was Silk Road, an underground sales outlet with about 70% of sales being illegal drugs. It was shut down by the FBI, coincidentally making the FBI one of the biggest Bitcoin holders. Having been told of the wonders of this currency I thought I would see just how much of a threat it is to the word's financial systems. Apparently there are about 12 million Bitcoins in circulation right now, with the number growing through some algorithm in the software that all users are obviously capable of reading and understanding, and which, of course, they trust that criminals like Silk Road haven't been tampering with to get an edge. 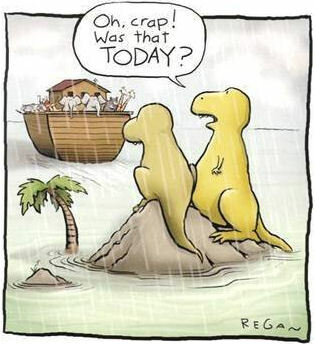 The maximum number of Bitcoins that can ever exist is 21 million, but nobody can predict when that might happen. Current speculative value at the time of writing is just under $US450/coin. Using these values, let's see how Bitcoin stacks up against the Australian economy (which is about the tenth largest in the world). The $AU is worth $0.94 at the time of writing and this has been factored into the calculations. Now, that's a lot of money, so let's see how it compares to the real world. Coles supermarket sales $35.8 billion 16.05% Just less than two months' grocery sales. There are other big supermarket chains. ASX market capitalisation $1,200 billion 0.48% Value of publicly listed shares on the Australian Stock Exchange (eighth biggest in the world). Does not include the value of futures contracts or any other derivatives. So it seems that if someone had all the Bitcoins in the world they could fund the Australian Government for five days, pay the bills for the smallest state for 13 months, keep bank shareholders happy for just under three months, buy all the shares sold on Monday and a bit of Tuesday and buy groceries and booze for almost two months. And this is going to take over the world economy real soon now. In one discussion with a true believer I pointed out that even if all the 21 million possible Bitcoins were here right now they would need an individual value of $2661 to match the amount of cash floating around in Australia. I was told that this was irrelevant because someone somewhere had said that they could be worth "100,000s of dollars each". (I was tempted to ask whether this "economist" was trading the things and simply talking up the market, but I already had hints that the person I was talking to lacked some knowledge of economics - one indicator of this was that he had answered some questions by telling me to study economics.) I noted that 21 million Bitcoins at $200,000 each was equivalent to only 31.5 hours of international foreign exchange trading and was then subjected to a rant that showed that the person I was talking to didn't know the difference between a market and the multiplier effect so I gracefully retired. Is Bitcoin a viable currency? No, it is a traded commodity. Is the world money system likely to be replaced by Bitcoins? Not now, not ever. Are the banks worried that their hegemony on the holding, lending and transferring of money is threatened? Bitcoin might be mentioned at a bank board meeting for a bit of amusement but deciding which biscuits to have with the coffee would worry board members more. Will people make money trading Bitcoins? 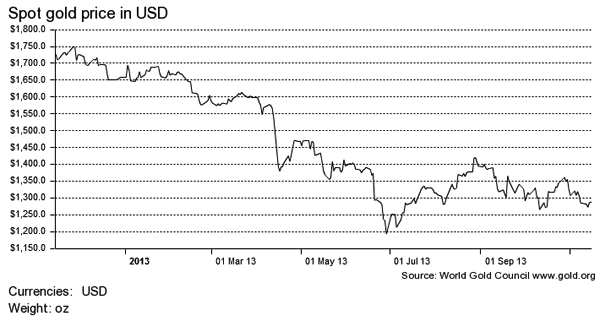 As long as there are enough people prepared to throw money at a speculative commodity there will be money to be made. Has anything like it ever been seen before? Yes, in Holland in the 17th century, but at least you could hold a tulip bulb in your hand. 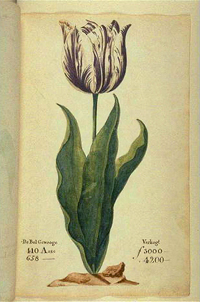 (The tulip in the picture sold in 1637 for ten times the annual wages of a skilled craftsman.) Will anything like it ever be seen again? Of course - there is always a new scam coming along. What I found surprising in all this is that all my discussions happened in forums that are supposed to be populated by skeptics and critical thinkers, although the several Bitcoin enthusiasts seemed to just appear at the mention of the word in the way that mention of circumcision or abortion almost anywhere on the 'net results in immediate spam, outrage and conflict. The passion shown by the true believers matched anything I've seen from religious bigots or racists. 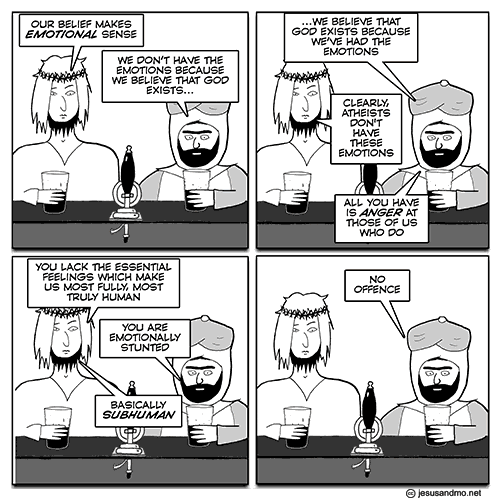 Their ability to produce straw men, misquote, provide non sequiturs and change the subject would do credit to any creationist or anti-vaccination liar. But, as one person told me, he was an expert in everything about it including the software code, the mathematical algorithm used to calculate value and number of issued coins, the security model (none, that I could see), the methods of communication and interaction between the many instances of the program and the inbuilt (but invisible to outsiders) method of auditing transactions. Despite all these he had no interest in it at all and was only arguing with me because I'm an idiot who can't see the truth and I should act like a real skeptic and look at the evidence. Well, I did look at the evidence, and what it told me was that emperors should be vary wary of Bitcoin promoters who offer to sell them clothes. I've been asked to write something for a magazine about Stan Burzynski's troubles with the FDA. It's an expanded version of what I said last week, with some background on the Burzynski story. Burzynski also claims to have a PhD earned and granted in 1968 by the university he was at in Poland but in 1973 he claimed DMSc from the same university on a grant application, with that being earned in the same single year - 1968. In 2011 he came up with what purported to be an affidavit, signed in 1990, saying that someone knew he had a PhD, although he was unable or unwilling to provide a copy of an actual testamur or certificate. In 1996-7 he was investigated for insurance fraud and the university told the investigator that it did not award doctorates in 1968, raising the question of why he didn't produce the 1990 affidavit then to refute this. University Microfilms have no record of him earning a PhD in the US. He lies about his qualifications. The rest of it is basically what I wrote last week. I wasn't planning to update the site this weekend because I expected to be fully involved with the Australian Skeptics' National Convention (a writeup of my talk will be appearing here shortly), but there have been two pieces of good news that I feel compelled to share. Another thing they like is to show before and after radiographs of the cancer to show how it has disappeared. Most aren't as blatantly stupid as the Brazilian faith healer I dealt with a few years ago, but they usually rely on the fact that people don't understand what they see on x-rays or other images. Here is evidence of a Burzynski miracle cure offered this week. The yellow arrow showing the "cancer" on the "before" image was included by the person claiming the cure. The first thing to notice is that the head is at a slightly different angle in both images. This probably wouldn't really matter, but I've had scans and the radiographer is usually very careful about positioning of body parts so that valid comparisons can be made over time. You will notice that the lesion is approximately the same size as the eyeballs shown in the second scan. But those eyes aren't visible in the first image. What this means is that the two slices are about half the diameter of the eyeball or tumor apart from each other. They are not scans of the same part of the brain. The image below shows the nature of this problem. 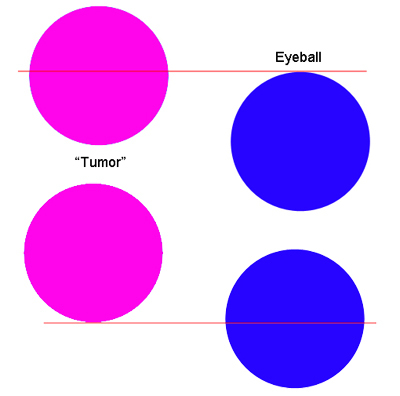 Both the eye and tumor are the same size, but the red line showing the slice would show the tumor and not the eye in the top one and the reverse in the bottom one. 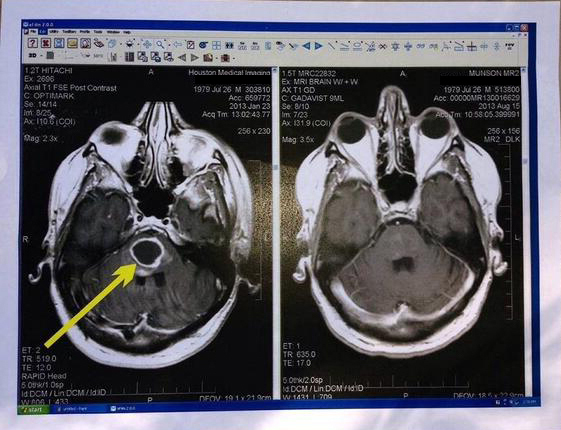 I don't know if this person had cancer to begin with (a single radiographic slice through the brain says little, although seeing that black spot can be frightening to a layman). There are a variety of reasons and conditions that can lead to something looking like that. What I do know is that the second image says nothing about whether that spot is still there. I have no reason to think that the person offering the images does not believe that he is cured. I do, however, think that he has been lied to. You will notice that both images are printed on the same piece of paper. If Burzynski offered this to a patient as evidence that cancer had been cured then he is either incompetent or a lying charlatan. I'm back from the Australian Skeptics National Convention. This year the theme was conspiracies, an appropriate topic as the convention opened on the 50th anniversary of the assassination of President John Kennedy, one of the most fertile grounds for conspiracists ever. As my talk was given with a lot of PowerPoint slides but without written notes I need some time to write it up, so it will probably appear here next week. I was, however, subject to what some might call a remarkable coincidence but could also be interpreted as an example of the world-wide conspiracy by Microsoft to spy on the users of their products. I was discussing the fact that the Microsoft conspiracy was predicted by the authors of the Old Testament when something surprising happened. Place your mouse over the picture below to see what appeared on the screen behind me as I was speaking about these words from Isaiah 54:12. I was accused of doing this deliberately, but I finally managed to convince people that I had nothing to do with it and it was simply a Microsoft product, in this case Windows XP, letting me know that I was being watched. I had something to say about the sorts of things that make people susceptible to believing in conspiracies in the latest edition of Australasian Science magazine. With the warmer weather approaching where I live I should soon be able to really get into character for writing my Naked Skeptic column, although I have to admit that there is an incentive to write quickly in winter time in order to get the stuff written before various body parts become numb. I am, of course, referring to my fingers, so you can put that last thought away right now!